This is “What Is Economics?”, section 1.3 from the book An Introduction to Business (v. 1.0). For details on it (including licensing), click here. Resources are combined to produce goods and services. Land and natural resources provide the needed raw materials. Labor transforms raw materials into goods and services. Capital (equipment, buildings, vehicles, cash, and so forth) are needed for the production process. Entrepreneurship provides the skill and creativity needed to bring the other resources together to capitalize on an idea. What goods and services should be produced to meet consumers’ needs? In what quantity? When should they be produced? How should goods and services be produced? Who should produce them, and what resources, including technology, should be combined to produce them? Who should receive the goods and services produced? How should they be allocated among consumers? 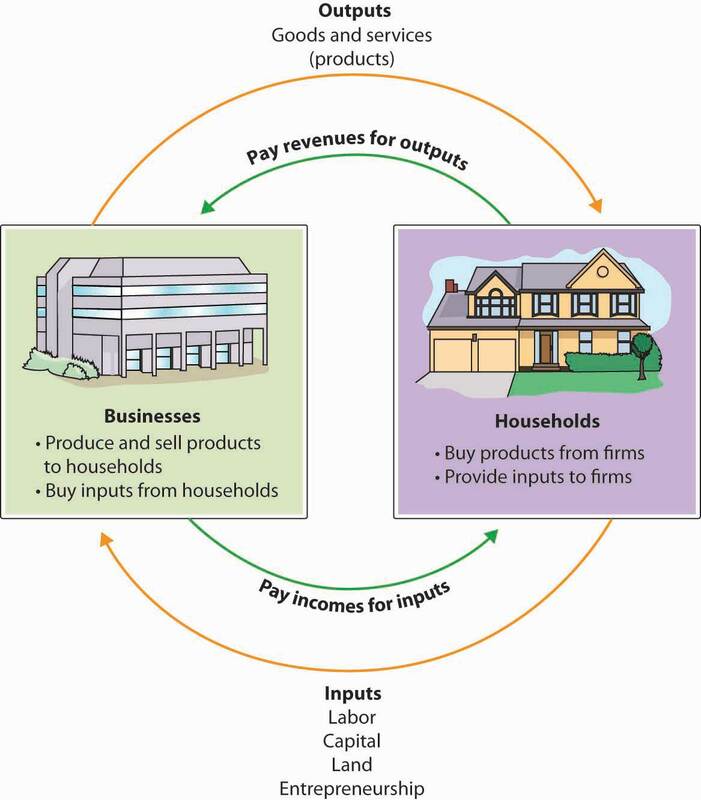 The answers to these questions depend on a country’s economic systemMeans by which a society makes decisions about allocating resources to produce and distribute products.—the means by which a society (households, businesses, and government) makes decisions about allocating resources to produce products and about distributing those products. The degree to which individuals and business owners, as opposed to the government, enjoy freedom in making these decisions varies according to the type of economic system. Generally speaking, economic systems can be divided into two systems: planned systems and free market systems. In a planned system, the government exerts control over the allocation and distribution of all or some goods and services. The system with the highest level of government control is communismEconomic system featuring the highest level of government control over allocation and distribution.. In theory, a communist economy is one in which the government owns all or most enterprises. Central planning by the government dictates which goods or services are produced, how they are produced, and who will receive them. In practice, pure communism is practically nonexistent today, and only a few countries (notably North Korea and Cuba) operate under rigid, centrally planned economic systems. Under socialismEconomic system falling between communism and capitalism in terms of government control over allocation and distribution., industries that provide essential services, such as utilities, banking, and health care, may be government owned. Other businesses are owned privately. Central planning allocates the goods and services produced by government-run industries and tries to ensure that the resulting wealth is distributed equally. In contrast, privately owned companies are operated for the purpose of making a profit for their owners. In general, workers in socialist economies work fewer hours, have longer vacations, and receive more health, education, and child-care benefits than do workers in capitalist economies. To offset the high cost of public services, taxes are generally steep. Examples of socialist countries include Sweden and France. The economic system in which most businesses are owned and operated by individuals is the free market systemEconomic system in which most businesses are owned and operated by individuals., also known as capitalismEconomic system featuring the lowest level of government control over allocation and distribution.. As we will see next, in a free market, competition dictates how goods and services will be allocated. Business is conducted with only limited government involvement. The economies of the United States and other countries, such as Japan, are based on capitalism. In comparing economic systems, it’s helpful to think of a continuum with communism at one end and pure capitalism at the other, as in Figure 1.5 "The Spectrum of Economic Systems". As you move from left to right, the amount of government control over business diminishes. So, too, does the level of social services, such as health care, child-care services, social security, and unemployment benefits. Though it’s possible to have a pure communist system, or a pure capitalist (free market) system, in reality many economic systems are mixed. A mixed market economyEconomic system that relies on both markets and government to allocate resources. relies on both markets and the government to allocate resources. We’ve already seen that this is what happens in socialist economies in which the government controls selected major industries, such as transportation and health care, while allowing individual ownership of other industries. Even previously communist economies, such as those of Eastern Europe and China, are becoming more mixed as they adopt capitalistic characteristics and convert businesses previously owned by the government to private ownership through a process called privatizationProcess of converting government-owned businesses to private ownership..
Like most countries, the United States features a mixed market system: though the U.S. economic system is primarily a free market system, the federal government controls some basic services, such as the postal service and air traffic control. The U.S. economy also has some characteristics of a socialist system, such as providing social security retirement benefits to retired workers. The free market system was espoused by Adam Smith in his book The Wealth of Nations, published in 1776.According to many scholars, The Wealth of Nations not only is the most influential book on free-market capitalism but remains relevant today. According to Smith, competition alone would ensure that consumers received the best products at the best prices. In the kind of competition he assumed, a seller who tries to charge more for his product than other sellers won’t be able to find any buyers. A job-seeker who asks more than the going wage won’t be hired. Because the “invisible hand” of competition will make the market work effectively, there won’t be a need to regulate prices or wages. Almost immediately, however, a tension developed among free market theorists between the principle of laissez-faire—leaving things alone—and government intervention. Today, it’s common for the U.S. government to intervene in the operation of the economic system. For example, government exerts influence on the food and pharmaceutical industries through the Food and Drug Administration, which protects consumers by preventing unsafe or mislabeled products from reaching the market. To appreciate how businesses operate, we must first get an idea of how prices are set in competitive markets. Thus, the next section begins by describing how markets establish prices in an environment of perfect competition. Economics is the study of how scarce resources (or factors of production) are used to produce the goods and services that will be distributed among people. Economists address these three questions: (1) What goods and services should be produced to meet consumer needs? (2) How should they be produced, and who should produce them? (3) Who should receive goods and services? The answers to these questions depend on a country’s economic system. The primary economic systems that exist today are planned and free market systems. In a planned system, such as communism and socialism, the government exerts control over the production and distribution of all or some goods and services. In a free market system, also known as capitalism, business is conducted with only limited government involvement. Competition determines what goods and services are produced, how they are produced, and for whom. If you started a business that made surfboards, what factors of production would you need to make your product? Where would you get them? Where would you find the money you’d need to pay for additional resources? Which three key questions do economists try to answer? Will answers to these questions differ, depending on whether they’re working in the United States or in Cuba? Explain your answer.